In the fourth quarter of 2018, the Bloomberg Barclays US Corporate High Yield Index (“Index”) return was -4.53%, and the CAM High Yield Composite gross total return was -3.41%. For the year, the Index returned -2.08%, and the CAM Composite returned -3.39%. The S&P 500 stock index return was -4.39% (including dividends reinvested) for 2018. The 10 year US Treasury rate (“10 year”) spent most of quarter going lower. It finished at 2.69% which was down 0.37% from the end of the third quarter. While generally range bound between 2.80% and 3.10% for the majority of the year, the 10 year popped both the top and bottom of the range during the fourth quarter as volatility made a comeback. During the quarter, the Index option adjusted spread (“OAS”) widened a massive 210 basis points moving from 316 basis points to 526 basis points. For context, the Index hasn’t posted an OAS north of 500 basis points in over two years. During the fourth quarter, every quality grouping of the High Yield Market participated in the spread widening as BB rated securities widened 148 basis points, B rated securities widened 219 basis points, and CCC rated securities widened 405 basis points. The Utilities, Banks, and REIT sectors were the best performers during the quarter, posting returns of -1.39%, -2.10%, and -2.57%, respectively. On the other hand, Energy, Finance, and Basic Industry were the worst performing sectors, posting returns of -10.04%, -5.45%, and -5.13%, respectively. At the industry level, airlines, office reits, and supermarkets all posted the best returns. The airline industry (-0.23%) posted the highest return. The lowest performing industries during the quarter were e&p, refiners, and oil field services. The oil field services industry (-16.12%) posted the lowest return. During the fourth quarter, the high yield primary market posted only $16.9 billion in issuance. Issuance within Energy was the strongest with just over 20% of the total during the quarter. The 2018 fourth quarter level of issuance was significantly less than the $86.2 billion posted during the fourth quarter of 2017. While the 2017 issuance of $330.1 billion was the strongest year of issuance since 2014, the low issuance for 2018 was less than 40% of the 2017 total. The Federal Reserve held two meetings during Q4 2018. The Federal Funds Target Rate was raised at the December 19th meeting. Reviewing the dot plot from Bloomberg that shows the implied future target rate, the Fed is expected to increase two more times in 2019. This is down from the three additional raises projected at the end of last quarter. However, based off certain market trading levels, traders are actually projecting a Fed cut as early as 2020. i While the Fed continued raising rates, the market has begun contemplating slowing growth and certain parts of the yield curve have started to invert. Since inversion, more research has been published on the meaning an implication. Importantly, the much watched 2year/10year has yet to invert and at quarter end maintained a spread of 19 basis points. Additionally, some market participants are not as concerned that the yield curve inverts, but they are focused on the magnitude of inversion. There has been work done suggesting that the central bank is compressing the 10 year by around 65 basis points.ii While the Target Rate increases tend to have a more immediate impact on the short end of the yield curve, yields on intermediate Treasuries decreased 38 basis points over the quarter, as the 10-year Treasury yield was at 3.06% on September 30th, and 2.68% at the end of the quarter. The 5-year Treasury decreased 44 basis points over the quarter, moving from 2.95% on September 30th, to 2.51% at the end of the quarter. Intermediate term yields more often reflect GDP and expectations for future economic growth and inflation rather than actions taken by the FOMC to adjust the Target Rate. Inflation as measured by core CPI has been moving steadily higher during 2018 from 1.8% to 2.4% and has settled at 2.2% as of the December 12th report. The revised third quarter GDP print was 3.4% (QoQ annualized rate). The consensus view of most economists suggests a GDP for 2019 around 2.6% with inflation expectations around 2.2%. The midterm elections came and went during the quarter. Much as the market expected, Congress is now divided with the Republican Party maintaining control of the Senate and the Democratic Party controlling the House of Representatives. The oil market maintained a persistent downtrend throughout the quarter on a combination of supply concerns and declining economic growth outlooks. It was a brutal three months as WTI moved from $75 per barrel to $45 per barrel. Another theme during the quarter was the ongoing trade and tariff negotiation between the United States and China. Currently, the two countries are in talks to try and reach an agreement by March 1st. 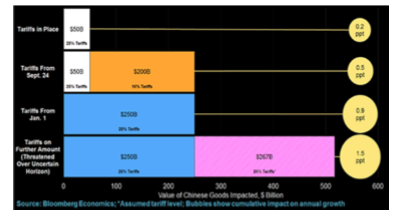 At which time, a trade truce expires and tariffs on $200 billion of Chinese goods will hike to 25%. The resolution of this trade war will undoubtedly be a major focus in 2019 as the implications are vast. As of this writing, Apple has announced a revenue guidance cut from $91 billion to $84 billion citing among other things a slowdown in China. Being a more conservative asset manager, Cincinnati Asset Management remains significantly underweight CCC and lower rated securities. For the fourth quarter, the focus on higher quality credits did finally bear fruit. As noted above, our High Yield Composite gross total return outperformed the return of the Index by 1.12%. Our underweights in the banking sector and gaming industry were a drag on our performance. Additionally, our credit selections with the other industrial and automotive industries hurt performance. However, our overweight in the consumer non-cyclical sector and underweight in energy were bright spots. Additionally, our credit selections within utilities and healthcare were a benefit to performance. The Bloomberg Barclays US Corporate High Yield Index ended the fourth quarter with a yield of 7.95%. This yield is an average that is barbelled by the CCC rated cohort yielding 12.55% and a BB rated slice yielding 6.24%. While the yield of 7.95% is up 1.71% from the 6.24% of last quarter, seeing near an 8% yield hasn’t happened in well over two years. Equity volatility, as measured by the Chicago Board Options Exchange Volatility Index (“VIX”), came out of its shell during the fourth quarter. The VIX ended the third quarter around 12 however; the level elevated in October and November before the big spike above 35 in the second half of December. High Yield default volume stayed low during the fourth quarter with only seven issuers defaulting. The twelve month default rate was 1.08% when iHeart Communications is excluded from the total and remains well below the historical average. iii Additionally, fundamentals of high yield companies continue to be generally solid. From a technical perspective, supply remains very low and could possibly provide some support as investors begin bargain hunting after the higher move in yields. As can be seen in the correlation triangle, high yield also has a diversification benefit relative to equities and investment grade credit. Due to the historically below average default rates, the higher yields available, and the diversification benefit in the High Yield market, it is very much an area of select opportunity that deserves to be represented in many client portfolio allocations. Over the near term, we plan to remain rather selective. As the riskiest end of the High Yield market showed cracks in the quarter, our clients began to accrue the benefit of our positioning in the higher quality segments of the market. However, one quarter does not make a credit cycle, and we believe that it is over a complete cycle where our clients will gain the most benefit. The market needs to be carefully monitored to evaluate that the given compensation for the perceived level of risk remains appropriate on a security by security basis. It is important to focus on credit research and buy bonds of corporations that can withstand economic headwinds and also enjoy improved credit metrics in a stable to improving economy. As always, we will continue our search for value and adjust positions as we uncover compelling situations. In the third quarter of 2018, the Bloomberg Barclays US Corporate High Yield Index (“Index”) return was 2.40%. For the year, the Index return was 2.57%. The 10 year US Treasury rate (“10 year”) was mostly range bound during the quarter oscillating between 2.8% and 3.0%. However, around mid-September, the 10 year started moving higher and reached a high of 3.1%. Back in mid-May the 10 year had a similar swing higher reaching 3.1% before moving back down to the 2.8% area. High Yield remains one of the best performing asset classes within fixed income, and CCC and lower rated securities continue to outperform higher quality counterparts. As we have stated many times previously, it is important to note that during 2008 and 2015, CCC rated securities recorded negative returns of 44.35% and 12.11%, respectively. We highlight these returns to point out that with outsized positive returns come outsized possible losses, and the volatility of the CCC rated cohort may not be appropriate for many clients’ risk profile and tolerance levels. During the quarter, the Index option adjusted spread (“OAS”) tightened 47 basis points moving from 363 basis points to 316 basis points. As a reminder, the Index spread broke the multi-year low of 323 basis points set in 2014 by reaching 311 basis points in late January. The longer term low of 233 basis points was reached in 2007. Mid-April 2018 had a low spread of 314 basis points essentially retesting the 311 spread of late January. Importantly, after the January low the OAS touched 369 basis points in February. Additionally, after the April low the OAS touched 372 basis points in May. Within the High Yield Market, opportunities can show up quite rapidly at times. During the third quarter, every quality grouping of the High Yield Market participated in the spread tightening as BB rated securities tightened 47 basis points, B rated securities tightened 60 basis points, and CCC rated securities tightened 14 basis points. The Consumer Non-Cyclical, Communications, and Transportation sectors were the best performers during the quarter, posting returns of 3.20%, 3.19%, and 3.09%, respectively. On the other hand, Consumer Cyclical, Capital Goods, and Banking were the worst performing sectors, posting returns of 1.50%, -1.86%, and -1.89%, respectively. At the industry level, supermarkets, pharma, wireless, and cable all posted strong returns. The pharma industry (4.48%) posted the highest return. The lowest performing industries during the quarter were retail reits, office reits, lodging, and retailers. The retail reit industry (-0.13%) posted the lowest return. During the third quarter, the high yield primary market posted $50.8 billion in issuance. Issuance within Financials and Energy was quite strong during the quarter. The 2018 second quarter level of issuance was significantly less than the $72.9 billion posted during the third quarter of 2017. Year to date 2018 issuance has continued at a much slower pace than the strong issuance seen in 2017. The full year issuance for 2017 was $330.1 billion, making 2017 the strongest year of issuance since 2014. Year to date, the 2018 issuance pace is roughly 27% slower than the same measurement period in 2017. The Federal Reserve held two meetings during Q3 2018. The Federal Funds Target Rate was raised at the September 26th meeting. Reviewing the dot plot from Bloomberg that shows the implied future target rate, the Fed is expected to increase one more time in 2018 and three more times in 2019. However, based off certain trading levels, the market implied policy rate is projected to be lower than current Fed projections.i Some market concern has risen about the yield curve possibly inverting. However, New York Fed President John Williams was quoted “We need to make the right decision based on our analysis of where the economy is and where it’s heading in terms of our dual-mandate goals. If that were to require us to move interest rates up to the point where the yield curve was flat or inverted, that would not be something I would find worrisome on its own.” While the Target Rate increases tend to have a more immediate impact on the short end of the yield curve, yields on intermediate Treasuries increased 20 basis points over the quarter, as the 10-year Treasury yield was at 2.86% on June 30th, and 3.06% at the end of the quarter. The 5-year Treasury increased 21 basis points over the quarter, moving from 2.74% on June 30th, to 2.95% at the end of the quarter. Intermediate term yields more often reflect GDP and expectations for future economic growth and inflation rather than actions taken by the FOMC to adjust the Target Rate. Inflation as measured by core CPI has been moving steadily higher during 2018 from 1.8% to 2.2% as of the September 13th report. The revised second quarter GDP print was 4.2% (QoQ annualized rate). While this print undoubtedly contained some transitory factors due to tax reform, the average of the last four GDP prints stands at a solid 3.08%. The consensus view of most economists suggests a GDP for 2018 in the upper 2% range with inflation expectations at or above 2%. A major theme in the third quarter was US trade negotiations. As stated in our previous commentary, trade remains a risk as the global status quo continues to be shaken up. At the end of August, the North American Free Trade Agreement (“NAFTA”) revamp was making headlines. The United States and Mexico had reached a new agreement but, at the time, an agreement could not be reached with Canada. Many business leaders and members of Congress made clear that Canada must be part of the equation going forward.ii Canada finally reached an agreement on the new US- Mexico-Canada Agreement (“USMCA”) just before the deadline at midnight on September 30th.iii While the USMCA negotiations are winding down, the trade negotiation with China is heating up. The United States has imposed tariffs on Chinese goods and China has responded with their own retaliatory tariffs.iv At this juncture, the economic impact is small but the risk of escalation is present and must be monitored. Being a more conservative asset manager, Cincinnati Asset Management remains significantly underweight CCC and lower rated securities. For the third quarter, the focus on higher quality credits did bear fruit, but not enough to overcome the riskiest segment of the High Yield Market. While the CCC segment had only 14 basis points of spread tightening, the superior return was driven by a lower duration and higher coupon relative to the other rating categories within high yield. Our third quarter High Yield Composite gross total return under-performed the return of the Bloomberg Barclays US Corporate High Yield Index (2.09% versus 2.40%). Our underweight in the energy sector and the pharmaceuticals industry were a drag on our performance. Additionally, our credit selections with the consumer cyclical industries of services and leisure hurt performance. However, our overweight in the consumer non‐cyclical sector was a bright spot. Additionally, our credit selections within the midstream industry, capital goods sector, and other industrial sector were a benefit to performance. The Bloomberg Barclays US Corporate High Yield Index ended the second quarter with a yield of 6.24%. This yield is an average that is barbelled by the CCC rated cohort yielding 8.87% and a BB rated slice yielding 5.14%. While the yield of 6.24% is down a bit from the 6.49% of last quarter, it is up nicely from the 5.44% of Q3 2017. Equity volatility, as measured by the Chicago Board Options Exchange Volatility Index, has continued its downtrend from the first quarter of this year. High Yield default volume was very low during the third quarter. In fact, the default volume for the quarter was the second lowest quarterly total since Q4 2013. The twelve month default rate was 2.02% and only 1.29% when iHeart Communications is excluded from the total.v The current default rate remains significantly below the historical average. Additionally, fundamentals of high yield companies continue to be generally solid. Finally, from a technical perspective, supply remains low and rising stars are outnumbering falling angels by a wide margin. This positive backdrop is likely to provide support for the market especially as sizeable coupon payment demand begins to kick in towards the end of the year. Due to the historically below average default rates and the higher income available in the High Yield market, it is still an area of select opportunity relative to other fixed income products. Over the near term, we plan to remain rather selective. When the riskiest end of the High Yield market begins to break down, our clients should accrue the benefit of our positioning in the higher quality segments of the market. The market needs to be carefully monitored to evaluate that the given compensation for the perceived level of risk remains appropriate on a security by security basis. It is important to focus on credit research and buy bonds of corporations that can withstand economic headwinds and also enjoy improved credit metrics in a stable to improving economy. As always, we will continue our search for value and adjust positions as we uncover compelling situations. reinvestment of dividends and interest. The index is unmanaged and does not take into account fees, expenses, and transaction costs. It is shown for comparative purposes and is based on information generally available to the public from sources believed to be reliable. No representation is made to its accuracy or completeness. In the second quarter of 2018, the Bloomberg Barclays US Corporate High Yield Index (“Index”) return was 1.03%. For the year, the Index return was 0.16%. While Treasury rates have generally increased throughout 2018, High Yield is one of the best performing asset classes within fixed income. As seen last year and also during Q1, the lowest quality portion of high yield, CCC rated securities, outperformed its higher quality counterparts. As we have stated many times previously, it is important to note that during 2008 and 2015, CCC rated securities recorded negative returns of 44.35% and 12.11%, respectively. We highlight these returns to point out that with outsized positive returns come outsized possible losses, and the volatility of the CCC rated cohort may not be appropriate for many clients’ risk profile and tolerance levels. During the quarter, the Index option adjusted spread widened 9 basis points moving from 354 basis points to 363 basis points. As a reminder, the Index spread broke the multi-year low of 323 basis points set in 2014 by reaching 311 basis points in late January. The longer term low of 233 basis points was reached in 2007. Mid April 2018 had a low spread of 314 basis points essentially retesting the 311 spread of late January. Every quality grouping of the High Yield Market except CCC rated securities participated in the spread widening as BB rated securities widened 16 basis points, B rated securities widened 9 basis points, and CCC rated securities tightened 45 basis points. The Energy, Communications, and Electric Utilities sectors were the best performers during the quarter, posting returns of 2.52%, 1.93%, and 1.47%, respectively. On the other hand, Banking, Consumer Cyclical, and Capital Goods were the worst performing sectors, posting returns of -1.58%, -0.23%, and -0.16%, respectively. At the industry level, supermarkets, pharma, oil field services, and independent energy all posted strong returns. The supermarket industry (5.48%) posted the highest return. However, automotive, tobacco, lodging, and building materials had a rough go of it during the quarter. The automotive industry (-3.00%) posted the lowest return. During the second quarter, the high yield primary market posted $52.8 billion in issuance. Issuance within Financials and Energy was quite strong during the quarter. The 2018 second quarter level of issuance was significantly less than the $75.6 billion posted during the second quarter of 2017. Year to date 2018 issuance has continued at a much slower pace than the strong issuance seen in 2017. The full year issuance for 2017 was $330.1 billion, making 2017 the strongest year of issuance since 2014. The Federal Reserve held two meetings during Q2 2018. The Federal Funds Target Rate was raised at the June 13th meeting. Reviewing the dot plot that shows the implied future target rate, the Fed is expected to increase two more times in 2018 and three more times in 2019. However, the Fed will be quite data dependent and likely show flexibility since Chair Powell plans to “strike a balance between the risk of an overheating economy and the need to keep growth on track.” While the Target Rate increases tend to have a more immediate impact on the short end of the yield curve, yields on intermediate Treasuries increased 12 basis points over the quarter, as the 10-year Treasury yield was at 2.74% on March 31st, and 2.86% at the end of the quarter. The 5-year Treasury increased 18 basis points over the quarter, moving from 2.56% on March 31st, to 2.74% at the end of the quarter. Intermediate term yields more often reflect GDP and expectations for future economic growth and inflation rather than actions taken by the FOMC to adjust the Target Rate. Inflation as measured by core CPI has been moving steadily higher during 2018 from 1.8% to 2.2% as of the June 12th report. The revised first quarter GDP print was 2.0%, and the consensus view of most economists suggests a GDP for 2018 in the upper 2% range with inflation expectations at or above 2%. The chart on the left from Bloomberg shows the yield compression of the 2 year US Treasury versus the 10 year US Treasury over the past year. While the Fed continues a less accommodative posture, other Central Banks aren’t necessarily following suit. The Bank of Japan is still buying an annualized JPY45 trillion of Japanese Government Bonds (“JGB’s”) and targeting a JGB yield of 0%. The Bank of England is maintaining bond purchases and keeping rates at 0.5%. Additionally, the European Central Bank has plans to keep rates where they are for at least another year as Mario Draghi recently commented “at least through the summer of 2019 and in any case for as long as necessary to ensure that the evolution of inflation remains aligned with the current expectations of a sustained adjustment path.” This backdrop has no doubt been a factor in the US Dollar appreciation during the second quarter of 2018. As can be seen in the charts below from Barclays, growth is increasingly driven by the US and policy is becoming more divergent. Investors had high expectations for the G7 Summit in Quebec in early June due to the United States’ positioning on global trade. However, the Summit left much to be desired. President Trump decided to leave early and withdraw support from the joint statement. Canada, France, and Germany all spoke out against the US President following the meeting. IMF’s Christine Lagarde noted that there is a risk to global growth with the escalating threats of a trade war. So while US growth has been improving, trade is a risk that needs to be monitored as the US continues to push for a shake up of the global status quo. Being a more conservative asset manager, Cincinnati Asset Management remains significantly underweight CCC and lower rated securities. For the second quarter, the focus on higher quality credits was again a detriment as our High Yield Composite gross total return underperformed the return of the Bloomberg Barclays US Corporate High Yield Index (-0.20% versus 1.03%). The higher quality credits that were a focus tended to react more negatively to the interest rate movements. Our credit selections in the capital goods, communications, and healthcare were an additional drag on our performance. However, our credit selections in the food & beverage and metals & mining industries were a bright spot. Additionally, our underweight in the energy sector hurt performance. Our credit selection within the midstream subsector was a benefit to performance. The Bloomberg Barclays US Corporate High Yield Index ended the second quarter with a yield of 6.49%. This yield is an average that is barbelled by the CCC rated cohort yielding 8.84% and a BB rated slice yielding 5.40%. The Index yield has become more and more attractive since the third quarter of 2017. Equity volatility, as measured by the Chicago Board Options Exchange Volatility Index, has trended down from the first quarter of this year but is still elevated relative to 2017. High Yield default volume was very low during the second quarter, and the twelve month default rate decreased to 1.98%. The current default rate remains significantly below the historical average. Fundamentals of high yield companies continue to be generally solid. Moody’s recently published results of a survey they conducted on the effects of the Tax Cut and Jobs Act. The results showed that across the credit spectrum, the majority of companies expect to be better off and have improved cash flow. Finally, from a technical perspective, while flows have continued to be negative in High Yield, demand (coupon + flows) is outstripping supply (issuance + redemptions). This positive backdrop is likely to provide support for the market especially as sizeable coupon payment demand begins to kick in towards the end of the year. Due to the historically below average default rates and the higher income available in the High Yield market, it is still an area of select opportunity relative to other fixed income products. Over the near term, we plan to remain rather selective. When the riskiest end of the High Yield market begins to break down, our clients should realize the benefit of our positioning in the higher quality segments of the market. The market needs to be carefully monitored to evaluate that the given compensation for the perceived level of risk remains appropriate on a security by security basis. It is important to focus on credit research and buy bonds of corporations that can withstand economic headwinds and also enjoy improved credit metrics in a stable to improving economy. As always, we will continue our search for value and adjust positions as we uncover compelling situations. During the first quarter of 2018, the High Yield Market gave back a modest amount of the gains seen in 2016 & 2017. The first quarter return of the Bloomberg Barclays US Corporate High Yield Index (“Index”) return was ‐0.86%. While the total return was negative, the return still bested most of the other asset classes within fixed income.i As seen last year, once again the lowest quality portion of high yield, CCC rated securities, outperformed their higher quality counterparts. As we have stated many times previously, it is important to note that during 2008 and 2015, CCC rated securities recorded negative returns of 49.53% and 12.11%, respectively. We highlight these returns to point out that with outsized positive returns come outsized possible losses, and the volatility of the CCC rated cohort may not be appropriate for many clients’ risk profile and tolerance levels. During the quarter, the Index option adjusted spread widened 11 basis points moving from 343 basis points to 354 basis points. While the Index spread did break the multi‐year low of 323 basis points set in 2014 by reaching 311 basis points in late January, it is still a ways off from the 233 basis points reached in 2007. Every quality grouping of the High Yield Market participated in the spread widening as BB rated securities widened 26 basis points, B rated securities widened 21 basis points, and CCC rated securities widened 28 basis points. The Other Financial, Transportation, and Other Industrial Sectors were the best performers during the quarter posting returns of 1.03%, .06%, and .00%, respectively. On the other hand, Banking, Consumer Cyclical, and REITs were the worst performers posting returns of ‐2.49%, ‐1.15%, and ‐1.13%, respectively. At the industry level, tobacco, wirelines, retailers, and healthcare all posted strong returns. The tobacco industry (1.92%) posted the highest return. However, restaurants, wireless, supermarkets, and food & beverage had a rough go of it during the quarter. The restaurant industry (‐2.75%) posted the lowest return. During the first quarter, the high yield primary market posted $72.7 billion in issuance. Importantly, almost three‐quarters of the issuance was used for refinancing activity. That was the highest level of refinancing since 2009. Issuance within Energy comprised just over a quarter of the total issuance. The 2018 first quarter level of issuance was relative to the $98.7 billion posted during the first quarter of 2017. The full year issuance for 2017 was $328.1 billion, making 2017 the strongest year of issuance since the $355.7 posted in 2014. The Federal Reserve increased the Federal Funds Target Rate three times during 2017. In the first quarter of 2018, Chairman Jerome Powell took over for outgoing Chair Janet Yellen. So far, the Fed has increased the Target Rate just once in 2018 at the March meeting. While the outlook is for three increases this year, Chair Powell plans to “strike a balance between the risk of an overheating economy and the need to keep growth on track.”ii Naturally, the Fed is quite data dependent and the outlook can change as 2018 progresses. While the Target Rate increases tend to have a more immediate impact on the short end of the yield curve, yields on intermediate Treasuries increased 33 basis points over the quarter, as the 10‐year Treasury yield was at 2.74% at March 31st, from 2.41% at the beginning of the quarter. The 5‐year Treasury increased 34 basis points over the quarter, moving to 2.56% at March 31st, from 2.21% at the start of the year. Intermediate term yields more often reflect GDP and expectations for future economic growth and inflation rather than actions taken by the FOMC to adjust the Target Rate. It was the cropping up of inflation concern that was the main driver of the intermediate term yield increase.iii The revised fourth quarter GDP print was 2.9%, and the consensus view of most economists suggests a GDP for 2018 in the upper 2% range with inflation expectations at or above 2%. Digging into the monthly details a bit should be beneficial in understanding the dynamics of the quarter. January and February were almost entirely about higher rates and inflation fears, with spreads hitting tights at the end of January and then correcting quite a bit in early February. Mid to late February saw spreads begin to come back down to help offset the continued increase of higher Treasury rates. The return of higher spreads in March was more about tempered growth enthusiasm as retail sales growth continued to be sluggish, January durable goods were weak, Atlanta FED’s GDPNow forecasts continued to slide lower, and fears that global trade wars would slow growth further. Interestingly, the 10 year Treasury yield peaked on February 21st versus the 5 year Treasury peaking a month later on March 20th. That flattening is telling as growth expectations came down while the Fed continues a less accommodative posture. According to Wells Fargo, global quantitative easing has been reduced by 50% from the fourth quarter of 2017 to the first quarter of 2018. Lower rated CCC credits underperformed in March after the outperformance displayed in January and February. As the second quarter gets under way, Treasuries are down from the highs, high yield spreads are off the lows, and higher quality credit seems compelling as lower rated credit has finally started to underperform. The chart to the left is sourced from Bloomberg and is the Chicago Board Options Exchange Volatility Index (“VIX”). The VIX is a market estimate of future volatility in the S&P 500 equity index. It is quite clear that the market has entered a period of higher volatility. In fact, the equity market through the first quarter of 2018 is already much more volatile than all of 2017 as measured by the number of positive and negative 1% days.iv In addition to the volatility witnessed throughout the markets during the first quarter, there have been a few transitions in high profile government posts as well. Jerome Powell began a four‐year term as Chair of the Federal Reserve following the end of Janet Yellen’s single term in that role; economist Larry Kudlow succeeded to director of the National Economic Council after Gary Cohn’s resignation; and Mike Pompeo and John Bolten were nominated as Secretary of State and National Security Adviser, respectively, after Rex Tillerson and HR McMaster were dismissed from the roles. The Administration has taken action to impose tariffs on steel and aluminum. These actions were taken after a US Department of Commerce report on section 232 of the Trade Expansion Act suggested that the tariffs were justified. Several countries are currently exempt from the tariffs, including Canada and Mexico, likely because of the ongoing NAFTA negotiations. However, there seems to be a fair amount of flexibility going forward to manage the duties as the Administration sees fit. China is taking exception to the tariffs and has responded by imposing their own tariffs on 128 different products.v While 128 products is a seemingly high number, it only amounts to about $3 billion which is just a fraction of total trade between the US and China. This appears to be a negotiation tactic and clearly a developing story over the balance of 2018. Being a more conservative asset manager, Cincinnati Asset Management remains significantly underweight CCC and lower rated securities. For the first quarter, that focus on higher quality credits was a detriment as our High Yield Composite gross total return underperformed the return of the Bloomberg Barclays US Corporate High Yield Index (‐1.83% versus ‐0.86%). The higher quality credits that were a focus tended to react more negatively to the interest rate increases. This was an additional consequence also contributing to the underperformance. Our credit selections in the food & beverage and home construction industries were an additional drag on our performance. However, our credit selections in the cable & satellite and leisure industries were a bright spot in the midst of the negative first quarter return. The Bloomberg Barclays US Corporate High Yield Index ended the first quarter with a yield of 6.19%. This yield is an average that is barbelled by the CCC rated cohort yielding 9.24% and a BB rated slice yielding 5.09%. The Index yield has become more and more attractive since the third quarter of 2017. While the volatility discussed earlier does lend itself to spread widening and higher yields, there are still positives in the environment to keep in mind. First, the current administration is viewed as pro‐business and the tax reform bill that was passed should provide benefits throughout 2018. Additionally, High Yield has displayed a fundamental backdrop that is stable to improving.vi The default volume did tick up during the first quarter, and the twelve month default rate is currently 2.36%.vii However, the current default rate is still significantly below the historical average. Also, a total of twelve issuers defaulted in the first quarter. Three of those issuers accounted for 74% of the default total. iHeart Communications was the largest to default accounting for 55% of the total. Separate from the uptick in the default ratio, the volume of distressed bonds did tick down in March. That was only the seventh downtick within the past two years. Finally, from a technical perspective, the high yield market generates close to $80 billion in coupon income every year. That is a nice supporting demand factor when facing a more volatile market environment. Due to the historically below average default rates and the higher income available in the High Yield market, it is still an area of select opportunity relative to other fixed income products. Over the near term, we plan to stay rather selective. The selectiveness should serve our clients well as we navigate the higher volatility environment. Further, if the High Yield market begins to break down, our clients should accrue the benefit of our positioning in the higher quality segments of the market. The market needs to be carefully monitored to evaluate that the given compensation for the perceived level of risk remains appropriate on a security by security basis. It is important to focus on credit research and buy bonds of corporations that can withstand economic headwinds and also enjoy improved credit metrics in a stable to improving economy. As always, we will continue our search for value and adjust positions as we uncover compelling situations. During the fourth quarter of 2017, albeit at a slower pace, the High Yield Market continued the positive return trend of the first three quarters. The Bloomberg Barclays US Corporate High Yield Index return was 0.47% for the fourth quarter. For the year, the Index returned 7.50% which leads many asset classes in the fixed income world. The lowest quality cohort, CCC rated securities and lower, once again outperformed their higher quality counterparts. The widely observed reach for yield continues unabated with highest risk, Ca‐D, followed by Caa‐rated bonds returning 13.76% and 10.38%, respectively, the highest returns of all high yield rating categories1 . It is important to note that during 2008 and 2015, the lowest quality cohort of CCC rated securities recorded negative returns of 49.53% and 12.11%, respectively. We highlight these returns to point out that with outsized positive returns come outsized possible losses, and the volatility of the CCC rated cohort may not be appropriate for many clients’ risk profile and tolerance levels. While the 10 year US Treasury finished the quarter and year essentially where it started, the 5 year US Treasury was noticeably higher on the quarter and year. The 5 and 10 year US Treasury ended 2016 at 1.928% and 2.447%, ended 3Q17 at 1.920% and 2.327% and finished 2017 at 2.210% and 2.411%, respectively. Offsetting the 29 basis point higher 5 year US Treasury during the fourth quarter was 3 basis points of tightening of spreads in the high yield index, suggesting much of the return was attributed to coupons. For the year however, the 28 basis point rise in the 5yr US Treasury was more than offset with 66 basis points of tightening in spread. While high yield spreads (343 basis points at year end) continue to grind tighter toward the multi‐year low of 323 basis points reached in 2014, it is still a ways off from the 233 basis points reached in 20071,2. Each quality cohort behaved in a similar fashion. For the year, the U.S. High Yield Index generated a total return of 7.50% leading many other fixed income markets. This compares to a 10‐year U.S. Treasury return of 2.14%. Also, the Investment Grade Corporate Bond Index return was 6.42% with spreads tightening 30 bps over the year 1. To consider the high yield performance in a broader context, a comparison to the total returns of other major asset classes is in this chart. (The returns may differ slightly due to the publisher’s selection of indices.) Equities delivered spectacular returns. Riskier classes outperformed, while the least risky asset classes lagged. Omitted is the frequently overlooked performance of gold, which rallied 14% in 20174. Intensifying geopolitical risks may be the catalyst. North Korea’s unbridled nuclear ambitions and Iran’s similar pursuits, as recently exemplified in its test launches of medium range ballistic missiles, are grave concerns. Both paths are troubling: forcing a change in behavior may be achieved only through armed conflict and the development of nuclear arsenals by these two rogue regimes and how they might eventually be deployed in light of their rhetoric is unimaginable. Considering the importance to the proper functioning of the global economy of oil exports from the Middle East, the threat of political instability and armed conflict is a major factor driving investment behavior. Industry sector analysis reveals the top three 2017 performers in descending order were utilities, chemicals and gaming/leisure. The worst performer was retail followed by telecommunications and then consumer products (source: JP Morgan 1/2/18). Moody’s reports that 18% of rated debt of retailers is rated Caa and lower, exceeding that during the “great recession” of 2007 – 2009. They estimate the speculative grade default rate of retailers to peak at 10.5% in March 2018, up from 8.9% at year‐end 2017 5. High profile retailers, Toys‐R‐Us filed in October and Sears Canada filed in December. Very weak retailers include luxury retailer Neiman Marcus, Sears Holdings and JC Penny. The seminal shift to online retailing will continue to cause disruptions across the “brick and mortar” retailing industry and related real estate industry. High yield issuance (excluding emerging markets) continued to be fairly robust at $282.4 billion across 525 deals, versus $226.8 billion across 359 deals in 2016. For the third quarter, issuance by broad rating category was essentially divvied up in line by market size of each broad rating category. Issuance from emerging markets based entities added $81.7 billion and 147 more deals. This was up significantly from 2016’s emerging markets’ $46.2 billion across 75 deals. The largest deals included $3.25 billion by Valeant Pharmaceuticals, $1.5 billion by Hilton Worldwide Holdings, $2.2 billion by Community Health Systems and $1.25 billion by Equinix 6. Most dealers interviewed by Prospect News expect high yield issuance to increase in 2018. Even with the Federal Reserve’s third 0.25% rate increase in the Federal Funds Target Rate on December 13, yields on intermediate Treasuries are slightly changed with the 10‐year Treasury at 2.41% at the end of 2017, roughly flat from 2.44% at the beginning of the year 7. The 10 year Treasury was the “pivot point” as the yield curve flattened as the FED raised the Fed Funds Target Rate with the 30‐year bond yield falling from 3.07% to 2.74%, while the 2‐year note yield climbed from 1.19% to 1.88% and the 5‐year note rose from 1.93% to 2.21% 8. Intermediate term yields more often reflect GDP and expectations for future economic growth and inflation rather than actions taken by the FOMC to adjust the Target Rate. Although the revised third quarter GDP print was 3.2% following the second quarter’s 3.1%, the consensus view of economists reported in The Wall Street Journal, forecasts a GDP of 2.7% for 2018 up from 2% at the end of September ( with Wall Street Journal’s consensus estimate of economists 12/1/2017 inflation expectations at 2.2% for 2018). It is easy to understand that the “search for yield” that we have witnessed continues and that the high yield market is benefitting from that search. The recently signed tax bill has significant changes that affect corporate earnings. The major elements impacting the majority of high yield issuers are: 1. The decline in the income tax rate from 35% to 21%, 2. The interest expense deductibility limit of 30% of adjusted taxable income (defined as EBITDA through 2021 and EBIT thereafter) and 3. The full expensing of qualifying capital expenditures. The chart to the left by S&P estimates that the new tax bill will have at most just slightly negative impact on companies with lower interest coverage ratios (those with more debt), “as the negative effect of lower interest deductibility would offset the positive effect of lower tax rates and the full expensing of capital expenditures” 10. The chart below on the left shows the percentage of investment grade and high yield issuers impacted to any degree by the new law’s limit on interest expense deductibility. Logically, a larger proportion of high yield companies are impacted, however, the impact in most cases is entirely manageable, as the chart above illustrates. Also, the percentage of high yield companies adversely impacted increases after 2021 with the change in the definition from EBITDA to EBIT, as shown in the chart below on the left. Furthermore, the chart below on the right shows the percentage of rated companies impacted by leverage ratio. The higher the leverage ratio, the greater the number of companies impacted. Being a more conservative asset manager, Cincinnati Asset Management remains significantly concentrated in less leveraged high yield companies. We limit our purchases to those companies rated single‐B or better, so we are underweight CCC and lower rated securities. So the changes in the tax law will have less of an impact on our portfolios than those of the broader high yield market, in which approximately 15% are rated CCC and lower11. This underweight contributed to our High Yield Composite performance lagging the return of the Bloomberg Barclays US Corporate High Yield Index (6.86% gross versus 7.50%) in 2017. Over the year, we continued to be cautious in our investment strategy, maintaining higher cash balances as we become more selective in our security purchases. Given the positive market performance, these cash balances served as a drag on our performance. The Bloomberg Barclays US Corporate High Yield Index ended 2017 with a yield of 5.72%. This yield is an average that is barbelled by the CCC and lower rated cohort yielding about 8.5% and a BB rated cohort yielding about 4.4% 12. These yields are being earned in an environment that is fairly attractive. S&P forecasts that the trailing 12‐month default rate of 3.0% as of 12/31/17 will fall to 2.7% by September 2018, significantly below the 36‐year historical average of 4.1%. S&P also observed that “nearly all market‐based measures of future default pressure are now at benign levels” 13. Due to the higher income available in the High Yield market, it is still an area of select opportunity relative to other fixed income products. The continued tightening of credit spreads needs to be carefully monitored to evaluate that the given compensation for the perceived level of risk remains appropriate on a security by security basis. It is important to focus on credit research and buy bonds of corporations that can withstand economic headwinds and also enjoy improved credit metrics in a stable to improving economy. As always, we will continue our search for value and adjust positions as we uncover compelling situations. During the third quarter of 2017, albeit at a slower pace, the High Yield Market continued the positive return trend of the first and second quarters. The Bloomberg Barclays US Corporate High Yield Index return was 1.98% for the third quarter. Positive returns of 2.70% and 2.17% were posted for the first and second quarters of 2017, respectively. Year to date the Index has returned 7.00% which leads many asset classes in the fixed income world. As seen in the first quarter of 2017, the lowest quality cohort of CCC rated securities once again outperformed their higher quality counterparts. The widely discussed reach for yield was once again on display. It is important to note that during 2008 and 2015, the lowest quality cohort of CCC rated securities recorded negative returns of 49.53% and 12.11%, respectively. We highlight these returns to point out that with outsized positive returns come outsized possible losses, and the volatility of the CCC rated cohort may not be appropriate for many clients’ risk profile and tolerance levels. While the 10 year US Treasury finished the quarter essentially where it started, the Index spread tightened 17 basis points moving from 364 basis points to 347 basis points over Treasuries. While the Index spread continues to grind tighter toward the multi‐year low of 323 basis points reached in 2014, it is still a ways off from the 233 basis points reached in 2007. Each quality cohort participated in the spread tightening as BB rated securities tightened 21 basis points, B rated securities tightened 21 basis points, and CCC rated securities tightened 33 basis points. The Energy Sector was back to its winning ways of 2016 during the third quarter of 2017. The Independent Energy and Oil Field Services Industries provided the tailwind that the Energy Sector needed after the negative returns posted in the second quarter. The Transportation, Utility, and Industrial Sectors were other top performers. The Communications Sector had a bit of tough time during the quarter as the Wireline Industry was the major drag on performance. Finally, the Consumer Non‐Cyclical Sector was one of the bottom performers as Amazon’s takeover of Whole Foods injected much uncertainty into the future landscape of the Supermarket Industry. Additionally, the Healthcare Industry saw more credit specific weakness in some of the hospital operators. During the third quarter, high yield issuance continued to be fairly robust at $79.8 billion versus $98.7 billion and $77.2 billion during the first and second quarters, respectively. For the third quarter, issuance by broad rating category was essentially divvied up in line by market size of each broad rating category. Year to date issuance stood at $255.6 billion. This pace is very likely to exceed 2016’s total issuance of $286.2 billion. Even as the Federal Reserve has increased the Federal Funds Target Rate twice this year, yields on intermediate Treasuries have declined with the 10‐year Treasury at 2.33% at September 30, roughly flat from 2.31% at the beginning of the quarter and down from 2.45% at the beginning of the year. Intermediate term yields more often reflect GDP and expectations for future economic growth and inflation rather than actions taken by the FOMC to adjust the Target Rate. Although the revised second quarter GDP print was 3.1%, the consensus view of most economists suggests a GDP in the 2% range with inflation expectations at or below 2%. It is easy to understand that the “search for yield” that we have witnessed continues and that the high yield market is benefitting from that search. The most recent FOMC meeting was on September 20th 2017. While the Committee voted to maintain the current Fed Funds Target Rate, they did note that they will initiate a balance sheet normalization program in October i. We expect the program to be a very long and slow process as to best mitigate the risk of riling the markets. The Fed’s current “dot plot” is projecting one hike in December and three additional hikes in 2018. While not all of the projected hikes might come to fruition, the Fed continues to move in the direction of easing up on the accelerator. This is unique relative to the other major central banks. The ECB, BOE, and BOJ have all continued to increase their balance sheets since 2015. 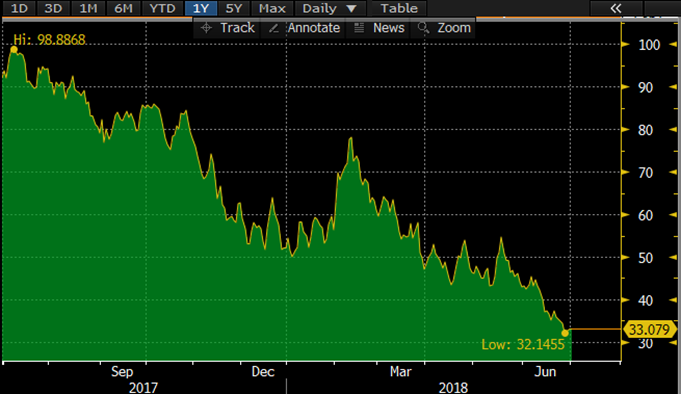 As we have discussed previously, high yield spreads continue to tighten at the same time the restrictive covenant protections contained in the indentures became more relaxed. The weakening of covenant protections has made its way to the loan market as large companies are increasingly able to finance their business with covenant‐lite terms ii. Additionally, weakened covenants are not simply a US phenomenon. International debt deals are increasingly covenant‐lite as well iii. This type of activity is not without consequences. J.Crew Group took advantage of covenants in their indenture to remove collateral value from some creditors. This type of activity is not happening across the board. Some creditors are successful in pushing back against companies while other creditors are not as lucky iv. More and more, a professional manager is needed to select bonds of quality – bonds that compensate the investor for the risks he undertakes in a high yield portfolio. Being a more conservative asset manager, Cincinnati Asset Management remains significantly underweight CCC and lower rated securities. This underweight contributed to our High Yield Composite performance lagging the return of the Bloomberg Barclays US Corporate High Yield Index (1.66% versus 1.98%) during the third quarter. Over the quarter, we continued to be cautious in our investment strategy, maintaining higher cash balances as we become more selective in our security purchases. Given the positive market performance, these cash balances served as a drag on our performance. We were also underweight the Energy Sector which was the best performing sector for the third quarter. On the other hand, some top contributors of our performance were our credit selections across the Capital Goods Sector as well as the Technology Sector. The Bloomberg Barclays US Corporate High Yield Index ended the third quarter with a yield of 5.45%. This yield is an average that is barbelled by the CCC rated cohort yielding about 8.5% and a BB rated cohort yielding about 4%. These yields are being earned in an environment that is fairly attractive. There has been a significant amount of central bank stimulus. High Yield has displayed a fundamental backdrop that is stable to improving. The default rate of 1.27% is significantly below the historical average and expected to remain low over the next year. Additionally, the default volume during the third quarter was the lowest amount since the fourth quarter of 2013v. Due to the higher income available in the High Yield market, it is still an area of select opportunity relative to other fixed income products. Over the near term, we plan to be rather selective. Changes to the Affordable Care Act are on the back burner at best, but tax reform is now front and center. Tax reform does have the ability to be a positive factor for the High Yield Market. That said, the continued tightening of credit spreads needs to be carefully monitored to evaluate that the given compensation for the perceived level of risk remains appropriate on a security by security basis. It is important to focus on credit research and buy bonds of corporations that can withstand economic headwinds and also enjoy improved credit metrics in a stable to improving economy. As always, we will continue our search for value and adjust positions as we uncover compelling situations. The Bloomberg Barclays High Yield Index returned 2.17% during the second quarter of 2017 and 4.93% for the first half of the year, continuing, although at a slower pace, the robust 2016 performance (+17.13%) which was the best since the 2009 recovery performance of 58.21%. Unlike Q1 and all of 2016, the highest rated credit sector (BB rated) outperformed the weaker sectors (i.e., BB rated bonds outperformed B and CCC rated bonds). While the highest rated credits within the universe outperformed the lower quality credits, the entire market was characterized by continued spread tightening – the Index spread tightened from 383 to 364, or 21 basis points over Treasuries and BB rated credits tightened from 252 to 227 or 25 basis points over Treasuries. Spreads are now near their tightest in almost a decade, and while performance during Q2 was positive across all credit subsectors, it is important to note that during 2008 and 2015, the lowest rated credit subsector (CCC) recorded negative returns of 49.53% and 12.11%, respectively. We highlight these returns to point out that with outsized positive returns come outsized possible losses, and the volatility of the CCC credit subsector may not be appropriate for many clients’ risk profile and tolerance levels. Unlike calendar 2016’s performance that was, in great measure, attributable to the robust recovery of the Energy Sector, Q2 witnessed positive performance by almost all Sectors, led by the Financial Institutions Sector, which was up 3.67%. That Sector accounts for over 9% of the Index, so its performance had a positive impact on the Index performance, but clearly not the significant impact that Energy played during 2016. In fact, Energy posted negative returns of 1.16% for Q2 as oil traded below $50 in the area of $45 per barrel for most of the quarter. Even as the FED has increased the Federal Funds Target Rate twice this year, yields on intermediate Treasuries have declined with the 10‐year Treasury at 2.31% at June 30, down from 2.39% at the beginning of the quarter and from 2.45% at the beginning of the year. Intermediate term yields more often reflect GDP and expectations for future economic growth rather than actions taken by the FOMC to adjust the Target Rate. The consensus view of most economists suggests a sluggish GDP in the 2% range with inflation expectations at or below 2%. It is easy to understand that the “search for yield” that we have witnessed for several years continues and that the high yield market is benefitting from that search. This search for yield has also been observed in the investment grade universe where the lowest credit rated debt has outperformed the investment grade index as a whole. During Q2, high yield issuance continued to be fairly robust at $76.7BB versus $98.7BB during Q1. Year to date issuance stood at $175.3BB. This pace could see us easily exceeding 2016’s total issuance of $286BB. Discussed at length during the year by many high yield observers was the fact that, while spreads were tightening, the restrictive covenants contained in the indentures under which the bonds were being issued were becoming more and more “relaxed”. In other words, while investors were searching for yield, issuers were able to negotiate with investors to remove covenants that previously were provided as standard protection for the investor: namely leverage constraints, disposition of assets, etc. More and more, a professional manager is needed to select bonds of quality – bonds that compensate the investor for the risks he undertakes in a high yield portfolio. Cincinnati Asset Management buys only B3/B‐ and higher rated securities, and, given that the CCC sector underperformed the Index as a whole, it is easily understood that our performance exceeded the Index for the 2nd Quarter (2.24% gross total return vs. 2.17%). During this period, we remained cautious in our investment strategy, maintaining higher than normal cash balances as we become more selective (higher credit quality) in our security purchases. Given the market performance, these cash balances served as a drag on our performance as well. An additional observation: The Index yield for the High Yield Market is 5.62%. Default rates have been low since the Energy sector “crisis” of 2015/16; however, there will always be defaults in the high yield universe. Historically, those defaults have come principally from the CCC and lower subsectors. So pricing needs to reflect that eventuality. With respect to 2017, we continue to be cautious. Many potentially positive factors could favorably impact corporations in the high yield space (changes in the tax code, relaxed and fewer regulations, etc. ); however, the impact of changes in trade agreements and the health of the global economy need to be carefully monitored. Defaults, excluding Energy, have remained lower than the long‐term average default rate – a positive sign with respect to the current health of the asset category. On the other hand, the “shrinking” spreads (i.e., implied premium to Treasury bonds) is of concern given that the “search for yield” may have resulted in an overvalued market. The tightening of spreads implies the expectation of a robust recovery in corporate performance. In this uncertain environment, it is important to focus on credit research and to attempt to buy bonds of corporations that we believe can withstand economic headwinds and can enjoy improved credit metrics in a stable to improving economy. The High Yield Market returned 2.70% during the first quarter of 2017, continuing, although at a slower pace, the robust 2016 performance (+17.13%) which was the best since the 2009 recovery performance of 58.21% (Bloomberg Barclays Indices). As was the case for all of 2016, Q1 performance was characterized by outsized performance of the weakest credit sectors within the Index, i.e., the CCC and lower rated credits, which currently account for approximately 15% of the high yield universe. These lowest rated credits returned slightly less than 5% during Q1 (they returned over 30% during 2016). In fact, if we were to exclude the CCC rated credit sub‐sector, the Index would have posted a 1.44% return, lower than our gross return performance of 2.00%. It is important to note that during 2008 and 2015, that lowest rated credit subsector recorded negative returns of 49.53% and 12.11%, respectively. We highlight these returns to point out that with outsized positive returns come outsized possible losses, and the volatility of that credit subsector may not be appropriate for many clients’ risk profile and tolerance levels. Unlike calendar 2016’s performance that was, in great measure, attributable to the robust recovery of the Energy Sector, Q1 witnessed positive performance by all Sectors, led by the Utility Sector, which was up 4.37%. That Sector accounts for less than 2.76% of the Index, so its performance had a positive impact on the Index performance, but clearly not the significant impact that Energy played during 2016 (The Energy Sector was up over 37% during 2016 and comprised approximately 15% of the Index at year end.) In fact, Energy’s 3.0% return approximated the overall Index as oil traded in a $50‐$55 range for most of the quarter, although it did drop to a low of $47.34 late in the quarter. The performance of the least credit‐worthy within the high yield universe represented the continuing “search for yield” that we have witnessed for several years as interest rates on Treasury bonds, in general, fell to their lowest levels in a decade during July ‘16 and then increased to a level at year end (2.45%) that was only marginally higher than where it began the year. After the FOMC increased the Federal Funds Target Rate by 25bps in December, the 10‐year Treasury yield declined from 2.60% mid‐December ’16 to 2.39% at March 31. (This search for yield has also been observed in the investment grade universe where the lowest credit rated debt has outperformed the investment grade index as a whole.) The result of this “search” has been the tightening of spreads, i.e. the premium yield of bonds relative to the risk free Treasury rate. At year‐end 2015, the premium yield on BB, B, and CCC rated bonds was 417, 654, and 1,351 basis points, respectively. We ended 2016 with those premia at 270, 382, and 807, respectively; and by March 31, spreads had tightened even more – to 252, 375, and 692, respectively. So, while Treasury rates over the first 3 months of 2017 declined, the premium demanded by the investor for “risk compensation” continued to fall considerably. We make note of this only to inform the investor of the market dynamics surrounding both yield movement (up and down) and premia movement: both impact bond prices. The demand for yield was met by $98.7BB in new issuance during Q1 2017; total 2016 issuance was $286BB. The Energy and Metal & Mining Sectors were the largest issuers, accounting for 13% and 10% of total volume, respectively. It is interesting to note that the several years prior to 2015, 17‐19% of new issuance came from the lowest rated credits, and that percentage declined dramatically during 2015‐2016, to just over 10% in 2016. However, Q1 2017 saw that percentage increase to almost 16%. Given that Cincinnati Asset Management does not buy CCC rated securities, it is easily understood that our performance trailed that of the Index for 1st Quarter (2.00% gross total return vs. 2.70%). We have remained cautious in our investment strategy, maintaining higher than normal cash balances as we become more selective (higher credit quality) in our security purchases. Given the market performance, these cash balances served as a drag on our performance as well. With respect to 2017, we continue to be cautious. Many potentially positive factors could favorably impact corporations in the high yield space (changes in the tax code, relaxed and fewer regulations, etc. ); however, the impact of changes in trade agreements and the health of the global economy need to be carefully monitored. Defaults, excluding Energy, have remained lower than the long‐term average default rate – a positive sign with respect to the current health of the asset category. On the other hand, the “shrinking” spreads (i.e., premium to Treasury bonds) is of concern given that the “search for yield” may have resulted in an overvalued market. While CCC spreads have tightened considerably, BB and B spreads remain modestly tighter on the year, although they had tightened considerably during 2016. The tightening of spreads implies the expectation of a robust recovery in corporate performance. In this uncertain environment, it is important to focus on credit research and to attempt to buy bonds of corporations that we believe can withstand economic headwinds and can enjoy improved credit metrics in a stable to improving economy. Cincinnati Asset Management’s High Yield Strategy remains conservatively positioned. The construction of the portfolio is driven by our bottom‐up analysis and our restriction from CCC‐rated securities adds an additional level of conservatism.